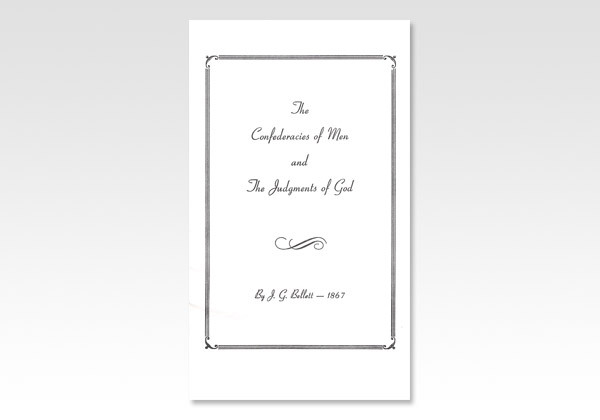 This is a reprint of a pamphlet sent out by our brother J. G. Bellett in the year 1867. Since then there has been a marked development of the principles brought before the Church of God by our departed brother. An understanding of these fundamental principles is deeply needed in our day by the saint who seeks to walk truly and thoroughly with God. "It may be painful and trying to keep aloof from latitudinarian unity; it has an amiable form in general, is in a measure respectable in the religious world, tries nobody's conscience, and allows of everybody's will. It is the more difficult to be decided about, because it is often connected with a true desire for good, and is associated with amiable nature; it seems rigid, and narrow, and sectarian, to decline so to walk. But the saint who has the light of Gad must walk clearly in that light. God will vindicate His ways in due time. Love to every saint is a clear duty; walking in their ways is not." The glory of Israel was in being, separate from the nations; their failure was in being like them. Now the believer has a life that is heavenly in its source and heavenly in its nature. "And this is the record, that God hath given to us eternal life, and this life is in His Son" - 1 John 5:11. Thus the Lord can say: "They are not of the world, even as I am not of the world" - John 17:16. The believer is blessed with all spiritual blessings in heavenly places in Christ - see Eph. 1:3. The hope is laid up for us in heaven - see Col. 1:5. We wait for God's Son from heaven - see 1 Thess. 1:10. "As we have borne the image of the earthy, we shall also bear the image of the heavenly" - 1 Cor. 15:49. We are called to press toward the mark for the prize of the calling on high of God in Christ Jesus - see Phil. 3:14. Thus Paul prays that the eyes of our understanding (heart) might be enlightened, that we might "know what is the hope of His calling, and what the riches of the glory of His inheritance in the saints" - Eph. 1:18.